There are lots of options available when it comes to building an online store. For example, you can get a self-contained solution and pay a monthly subscription, and have a nice online store. Or, you could use WordPress with any theme (using one of those ‘other’ options) and build your store with one of the many eCommerce plugins available. Another option is to use WordPress with Divi. That’s just scratching the surface when it comes to your options for starting an online store. Even with all of those options, Divi and WordPress is still the solution of choice for many web developers and store owners. In this article, we’ll explore a little bit about why this is the case. Let’s look at ten benefits of using Divi and WordPress to build an online store. 32% of the web uses WordPress. Because of this, there are a lot of resources available to help you build your website and learn how to use it. There are also a lot of options for hosting, customizing, and managing the website. It’s easy to learn and customize, SEO friendly, secure, responsive, includes lots of media and post types, and it’s accessible. It’s expandable with over 45,000 plugins and customizable with thousands of themes. WordPress itself is free, but you’ll still a domain name, hosting, etc. Of course, you have a lot of options for that too. 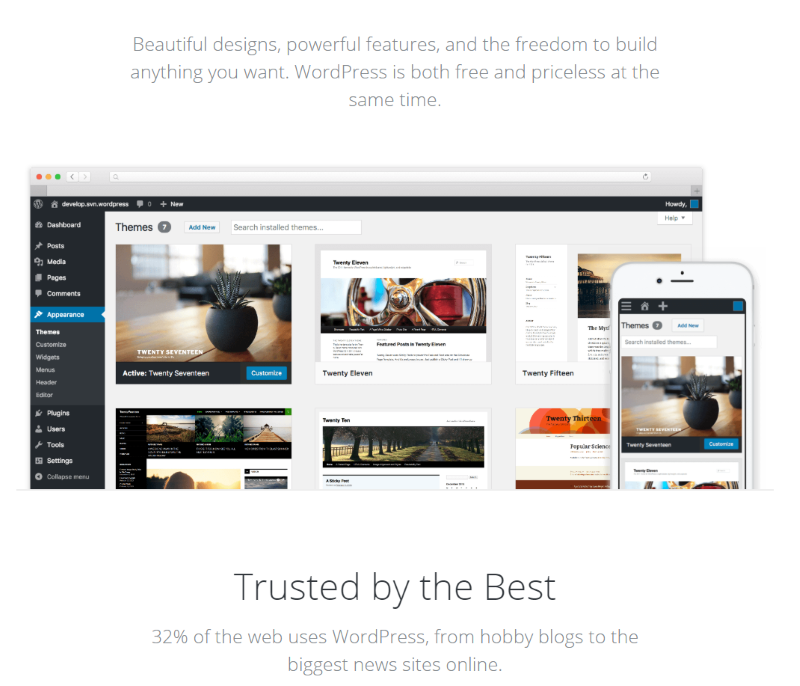 WordPress includes thousands of themes and plugins, support forums, detailed documentation, blog, and more, to help you create the best website possible. The huge community is filled with groups, tutorials, websites, videos, courses, books, products, support, developers, designers, and meetups. You can build practically anything you want with WordPress and add an online store to it. You don’t have to only build a store. You can build a blog, school, magazine, membership site, forum, personal site, services business site, and lots more, and include an online store on that site. You can also build an online store and add any of those features to it. You can build a site where the store is the primary focus, but your store can have a blog, forum, classrooms, membership area, and lots more. 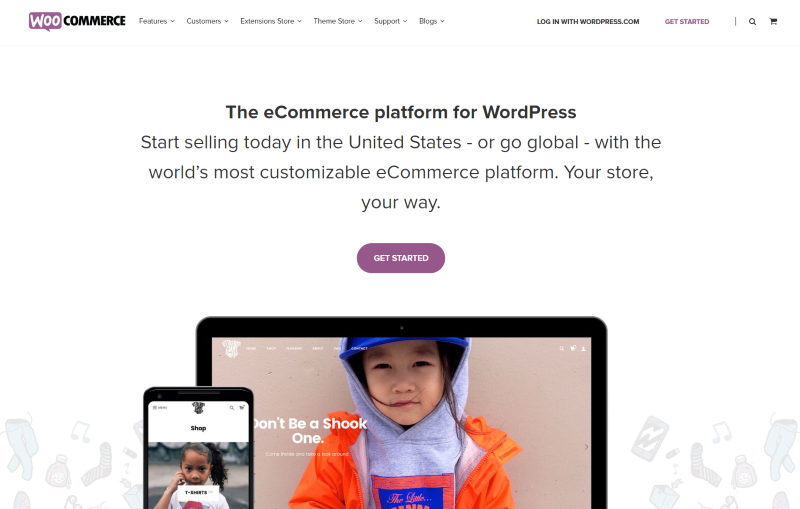 WooCommerce is a free eCommerce platform for WordPress. There are several other eCommerce platforms to choose from for WordPress, but with over 4 million active installations it’s safe to say that WooCommerce is the most popular eCommerce platform on WordPress. WooCommerce provides everything you need to create and manage an online store. You can easily add it to your existing WordPress site. Sell unlimited products. Sell physical products, virtual products, memberships, subscriptions, etc. It’s easy to expand and make your store unique. It also has a huge community with lots of plugins, themes, courses, books, support, designers, developers, meetups, blogs, tutorials, and more. The store is 100% yours. Since it’s on WordPress you have full control over your hosting. The WooCommerce suite is free, but there’s always a cost involved in running a website. For more information see the article How Much Does It Cost To Set Up and Run a WooCommerce Store? 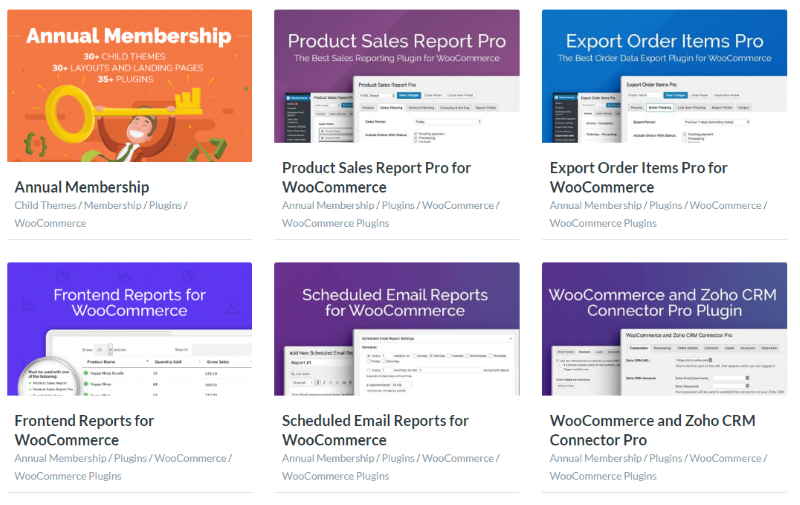 WooCommerce has an amazing amount of extensions available to help you build the exact features you want into your online store. Add subscriptions, bookings, product search, Google Analytics, payment gateways, social network integration, shipping options, newsletter integrations, reports, smart coupons, dynamic pricing, invoice printing, and lots more. Prices range from free to $299. There are hundreds of extensions to choose from, so you have control over the features you want and the amount you want to spend. You can add features as you grow. The Aspen Grove Studios shop even has several WooCommerce extensions available. 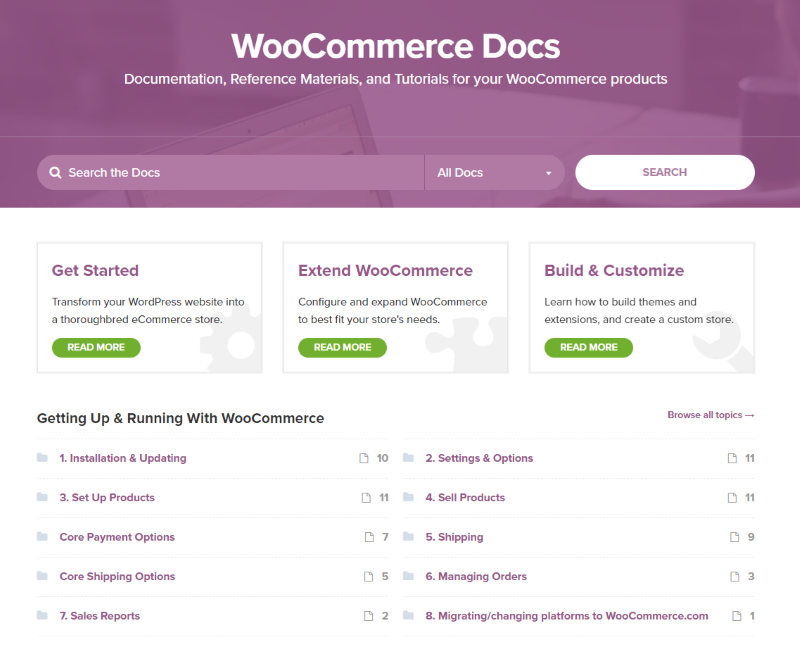 There is a lot of training available for WooCommerce including the WooCommerce blog, WooCommerce documentation, developer’s codex, and training within the plugin itself. The community also provides training through blogs, courses, books, tutorials, videos, and more. Create your own custom shop pages with the Divi shop module. It includes all of the customization features you’d expect from any Divi module so you can style it to fit within your website’s branding. Build from the backend or frontend. Display the types of products you want. Choose from recent, featured, sale, best selling, top rated, or choose the categories you want to display. Choose the number of products to display and the number of columns (from 1 to 6). Order by popularity, rating, date, or price. This makes it easy to create specific pages for specific types of products. 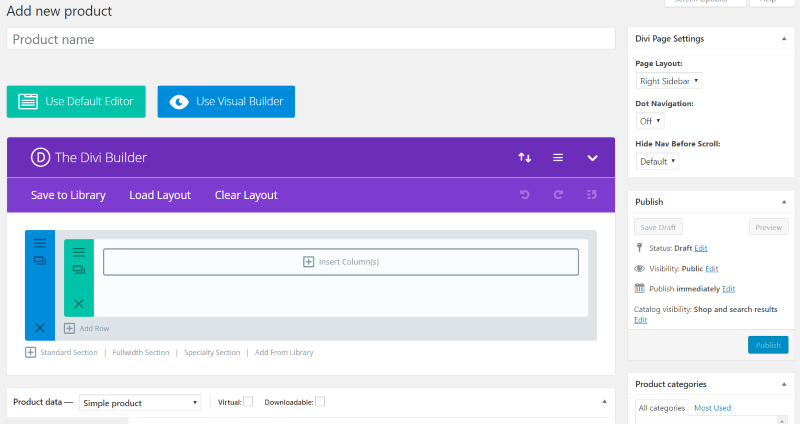 Create the layout for your WooCommerce product pages with the Divi Builder. This includes all the layout features and modules. 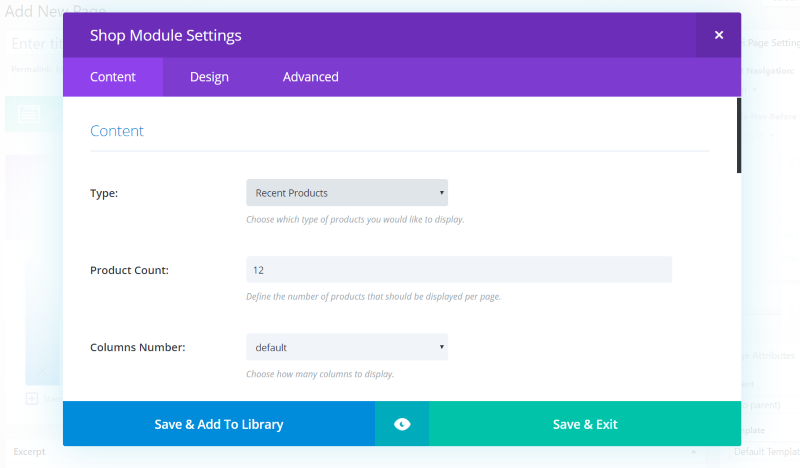 Divi Page Settings let you choose right, left, or no sidebar, dot navigation, and to hide navigation before scroll. Create layouts and save them to your library, or use premade layouts. Build the product page from the backend or frontend. 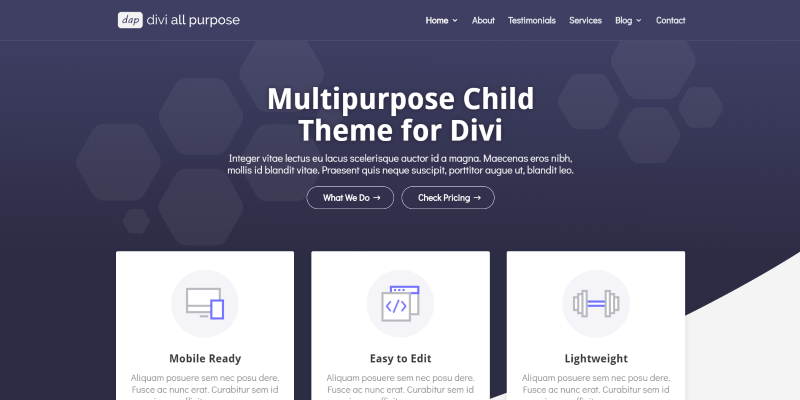 There are lots of Divi child themes and layouts available to create your online store with Divi, so you don’t have to build your website from scratch. They include premade layouts, customizations, pre-styled modules, and lots more. Many include multiple pages for your home page, about, shop, blog, contact, product categories, individual product pages, and all of the required WooCommerce pages. They’re professionally designed, saving you a lot of money for your website design and helping you to get your store started much faster. Divi is highly expandable. You can expand it through adding your own code to create custom features, using standard WordPress plugins to add features to WordPress, or by adding plugins that were created specifically for Divi. Divi is rich with third-party plugins to add just about any feature you can imagine. See our Divi plugins in the Aspen Grove Studios shop as well as many other shops and developers across the web. There is a lot of training available to help you learn Divi from beginner to advanced levels. Training includes the Divi documentation, the Elegant Themes blog, and detailed training built into Divi itself. There is also a lot of third-party training across the web in the form of blogs (like this one), courses (like those available from Divi Space), tutorials, YouTube videos, Facebook groups, and lots more. 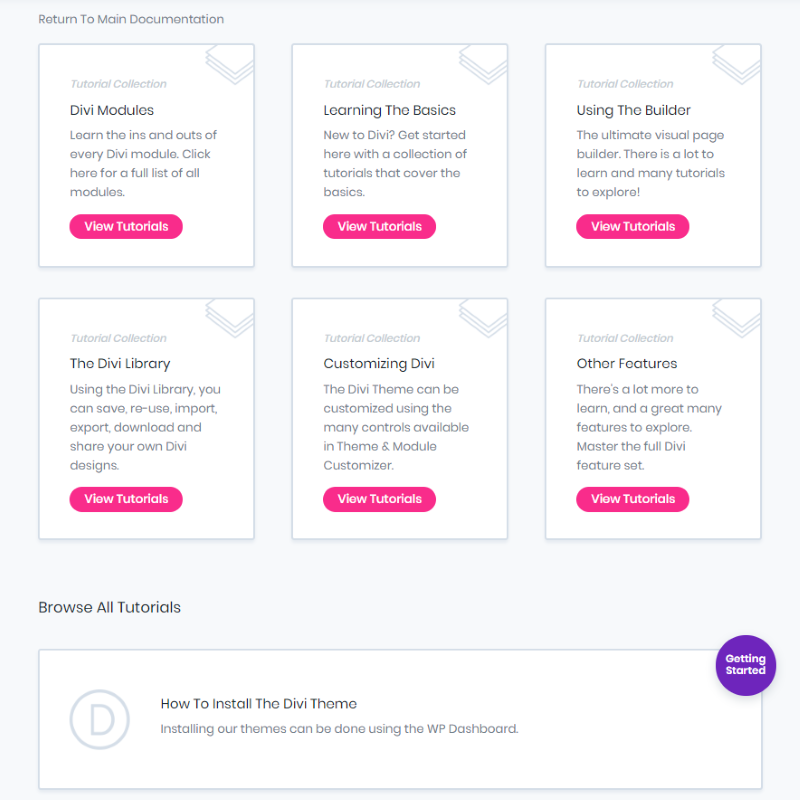 There is enough information out there on the web that you can learn to do anything you need to with Divi, and that includes learning how to start and run an online store. Divi and WordPress make a great team when it comes to building an online store. Both play well together. Separately they have many benefits, but when combined, those benefits add up to make an excellent platform that’s hard to beat. These ten benefits of using Divi and WordPress to build an online store will help you decide if Divi and WordPress are the best choices for your next online store. Do you use Divi and WordPress for your online store? Let us know about your experience in the comments. Previous post Get spooktacular savings in our Halloween SALE! 25% OFF EVERYTHING! Is this really correct? Is it not just the product description area that will benefit from Divi? Would Divi and WooCommerce handle up to 20,000 separate items? Yes WooCommerce and Divi most certainly would… the most important thing will be to have quality hosting and would suggest using a CDN as well to lighten the server load.